As part of Dasara, Automotive Sports Club of Mysuru has organised ‘Gravel Fest: Auto Cross Race’ tomorrow at 8.30 am near Lalitha Mahal helipad. Over 90 participants from Tamil Nadu, Kerala, Goa, Maharashtra and other States are expected to participate in the event which will be held under eight categories. Also 14 women will take part. Arrangements have been made to accommodate about 10,000 spectators. 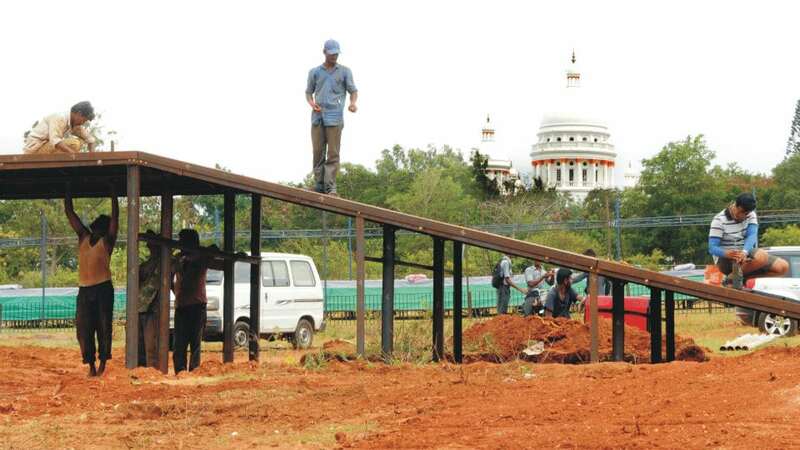 Picture shows the workers erecting the rampway for tomorrow’s Auto Cross Race.